Buying a real estate is one of the biggest financial decisions of life. It requires good amount of research and financial planning. With the increasing property prices and inflation, it is very difficult for most of us to make a lump sum payment while buying a home. You may go for home loan option but challenges are many starting from loan application to disbursement stage. The following tips will help you understand what to look for while buying a home. First step you need to do is budgeting, you need to make yourself ready with details that how much saving and investment you have till date for making down payment while buying a house. 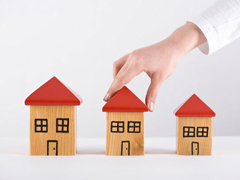 Start finding current housing rates in locality of your choice. Visit various projects interact with real estate brokers, go through property advertisement and real estate portals. Another way to find rates and upcoming project is by visiting property shows / exhibitions held in your city. How much down payment is to be made? Once you come to know average price you can decide amount required for making down payment. If you are planning to take home loan make inquiry to banks about your loan eligibility. Most of the bank provide home loan around 80% of your property document value. You have to make 20% down payment of the property’s cost. Builder may ask certain amount in black. As loan is given on white value only, you need to make down payment considering white value cost. This cost includes money given to builder by cheque, stamp duty and registration cost. Any additional cost is involved? Keep in mind that there are some charges for which you need to prepare your budget accordingly. If white component of property / property document value do not suffice for home loan amount required by you, than either you have to make arrangement of additional money or you have to produce bill of extra work. Builder will help you to get extra work bill, but this bill will cost you extra money. You need to pay service tax amount incurred on this cost to biller approximately 3% of bill amount. Other additional cost which you need to consider is stamp duty and registration cost which depends on location of property and prevailing rate (decided by government authority). You need to consider cost of loan processing fees charged by lender. If you are seeking a lawyer advice for the property due diligence or valuation you need to consider lawyer fees also. How much home loan I am eligible for? Before buying home you have to check about your maximum loan eligibility and how much you should borrow. This eligibility mostly depends on your monthly income. Approach the bank you plan to borrow from and ask it to assess your loan eligibility. They will issue you a letter stating your maximum eligibility for home loan. Some of bank also provide online module to check this eligibility. Which Interest rate loan option should I select? Home loan available from banks are having two options either you can opt for fixed interest rate option or variable (floating) interest rate option. In Fix Interest rate option rate of interest remains same over the period of home loan. In floating rate option rate of interest varies. If anyone opt for fixed rate home loans option than he has advantage over floating rate in a manner that if market pressure interest rate for upward movement than also this rate will be unchanged & borrower has to pay fix EMI. This option is best suited for person who wants to keep himself secure from varying interest rate and want to keep fix amount/fix tenure for payment of loan. If you want to take advantage of varying home loan interest rate you should opt for floating rate option. Finally after your loan is approved and payment of black and white amount is done you have to pay appropriate stamp duty and registration fees in order to get disbursement of loan. Don’t end up taking excessive loan; make sure you take home loan up to amount you can afford. Your first home doesn’t have to be the home of your dreams.